I just found this t-shirt at Target. I wish I had found it before Aaron's birthday - it would have fit perfectly with the birthday bike theme! Better late than never I guess. 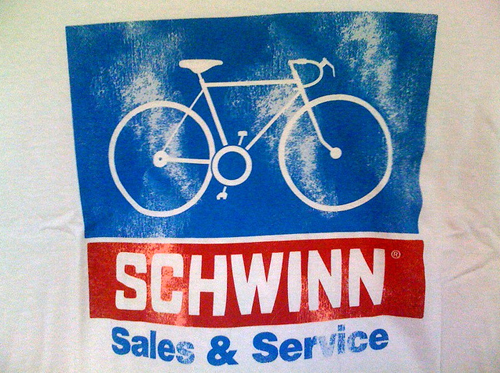 They carry a lot of Schwinn stuff at Target, tires, baskets and pumps. They had girl's shirts too so I had to get one too. 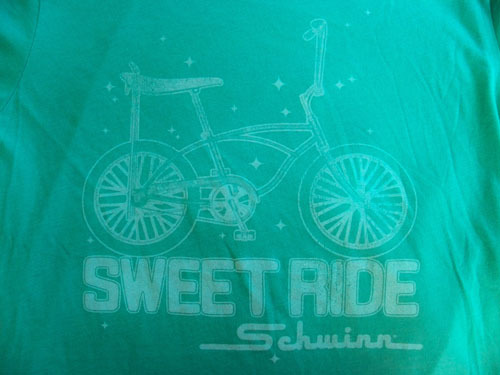 I need a Schwinn shirt to wear when we ride the tandem too! That's so cute, you always manage to find their cool t-shirts before the rest of us. I agree. I never did find the owl w/the trumpet & banjo shirt. I went to 4 different Targets and had my cousin in a different state look, too. You wouldn't happen to have the SKU#, would you (on receipt or maybe on tag)?? I have a friend who LOVES owls and her husband is a musician. Thank you. Jane - I found the tag from the owl t-shirt. Took a pic of it and will email it to you!